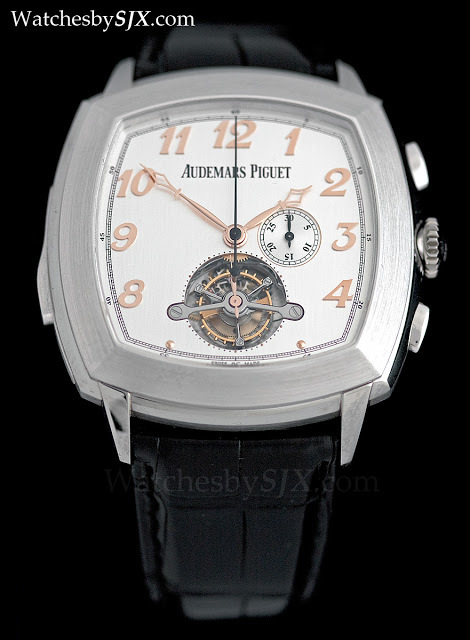 Unveiled at SIHH 2013, the Audemars Piguet Tradition Minute Repeater Tourbillon Chronograph is a traditional looking but at 47 mm, a distinctly modern watch. 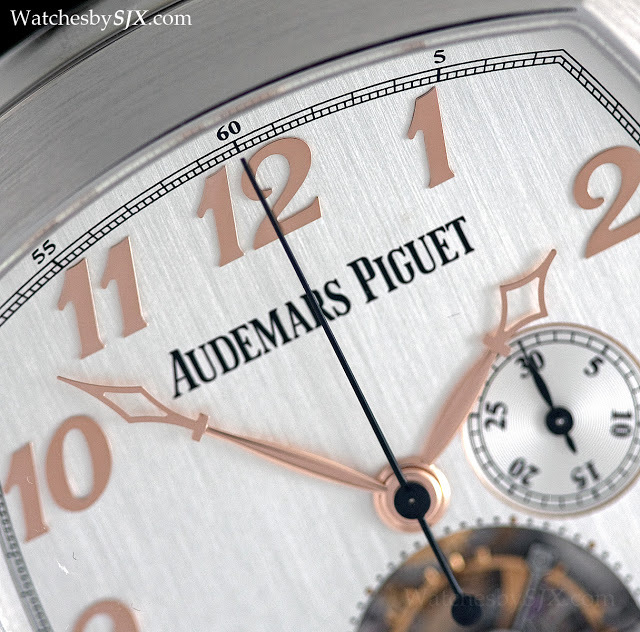 Audemars Piguet high complications all come from its subsidiary, AP Renaud & Papi (APRP). 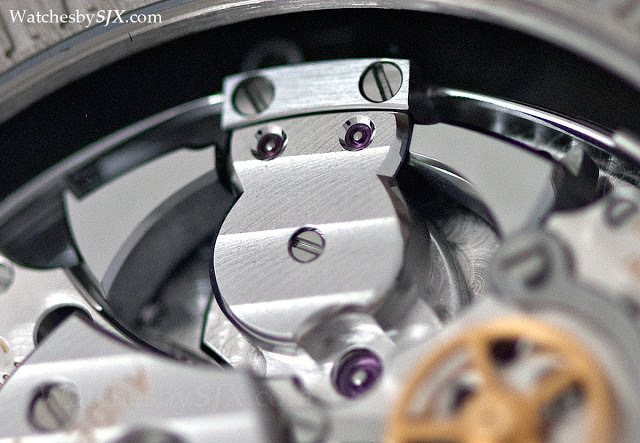 APRP is a formidable complications specialist, and the Tradition Minute Repeater Tourbillon Chronograph is arguably one of the less complicated complications it has developed; also unveiled at SIHH was the even more complicated Royal Oak Offshore Grande Complication. 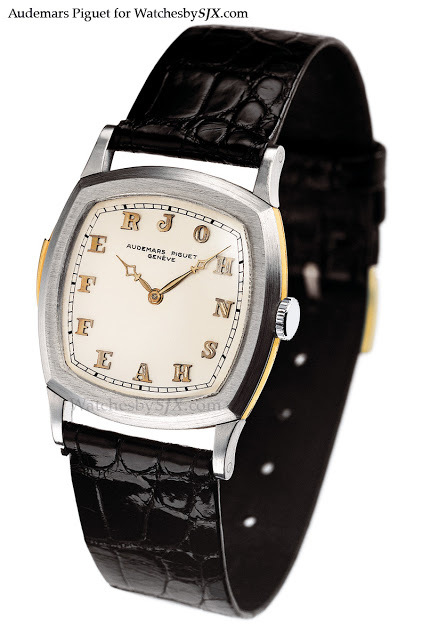 Styled like a 1920s pocket watch, the Tradition is actually a revival of the “John Shaeffer” watches of the nineties, which was itself inspired by a cushion shaped wristwatch made for a businessman named John Shaeffer whose 12-letter name was spelled out on the dial instead of hour indices. 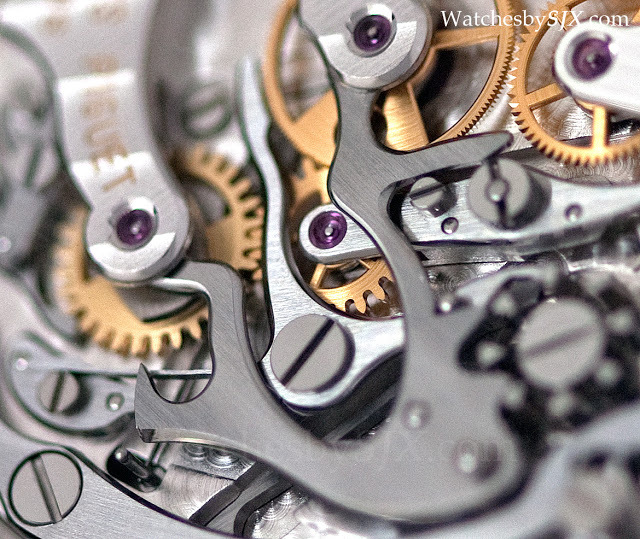 Like the original John Shaeffer, the Tradition Minute Repeater Tourbillon Chronograph is made of two metals. 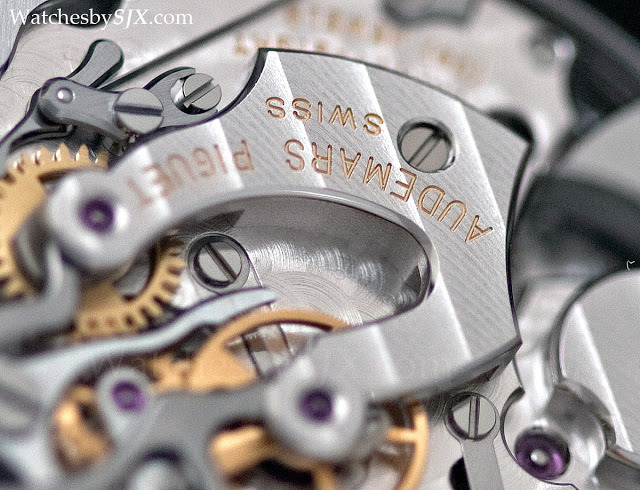 The 47 mm case is in titanium, while the bezel, case back, crown and pushers are white gold. 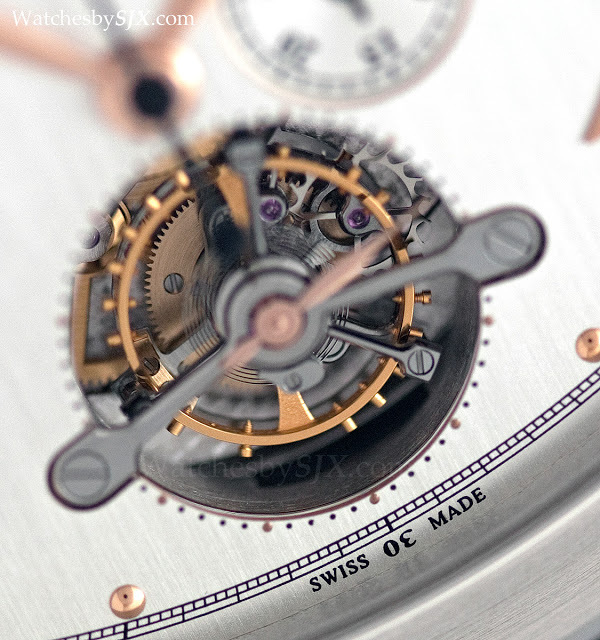 That means it is fairly light, despite its size. 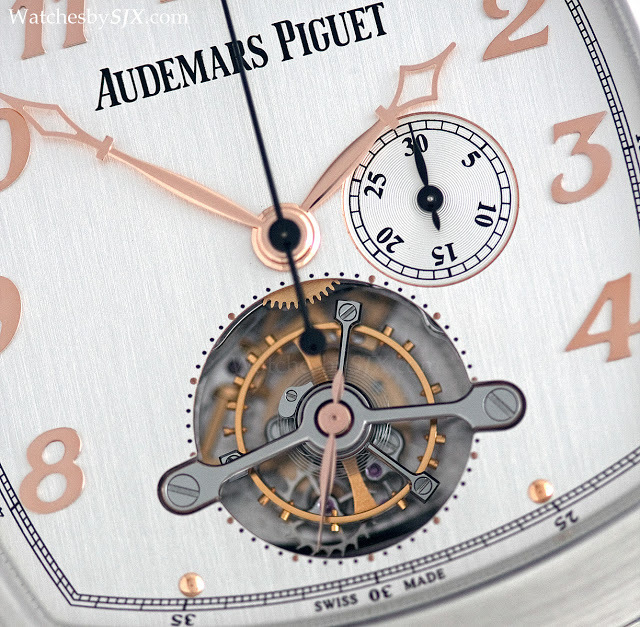 Notably AP has achieved a bright, polished finish on the titanium, leaving the contrast with the brushed white gold components barely obvious. 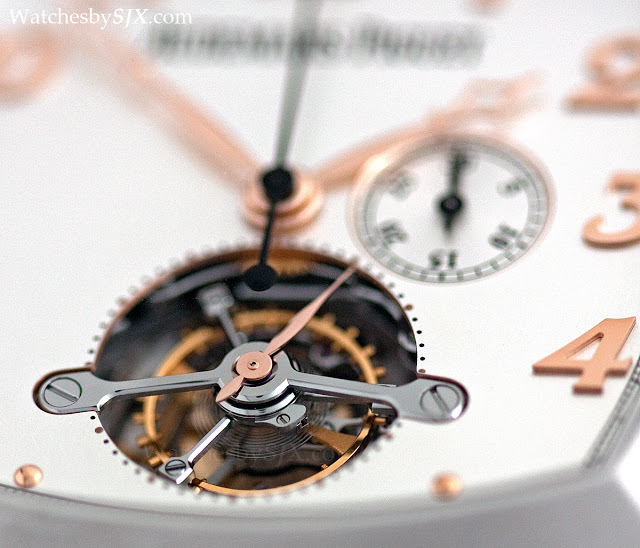 The dial is silvered, brushed, with applied rose gold numerals in the Breguet style. 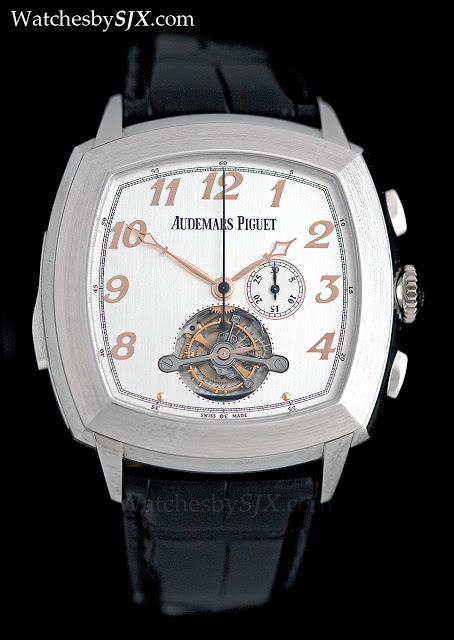 All in all a classical look, except for the large “Audemars Piguet” logo, and the minute counter at three o’clock which leaves the dial attractively asymmetrical. 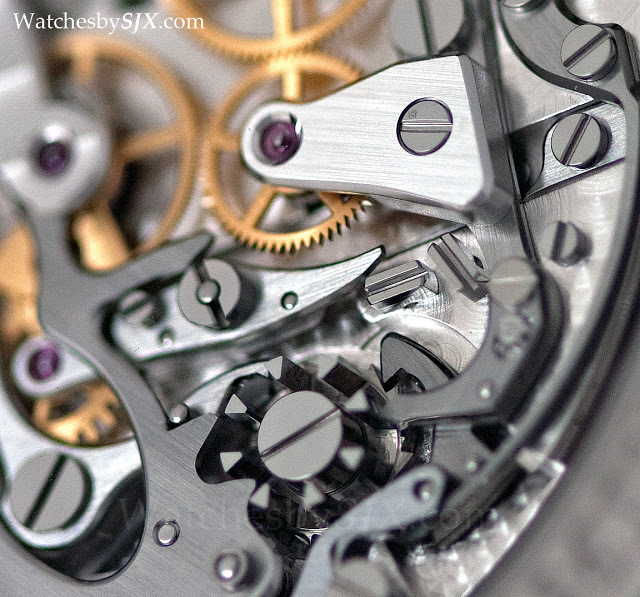 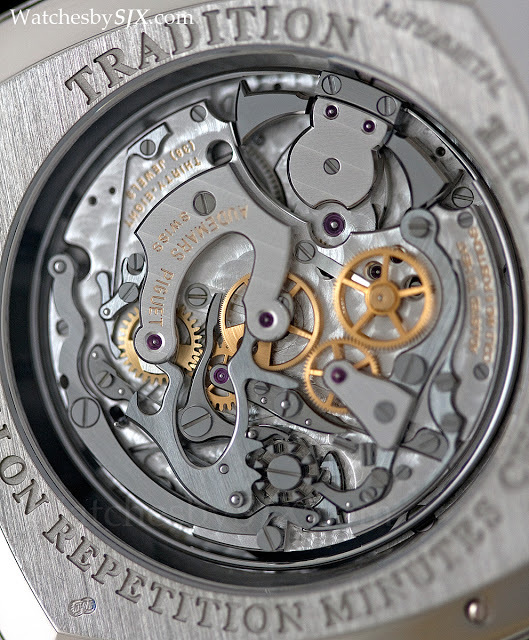 At six o’clock sits the aperture for the tourbillon, with the bridge and cage that are recognisably from APRP. 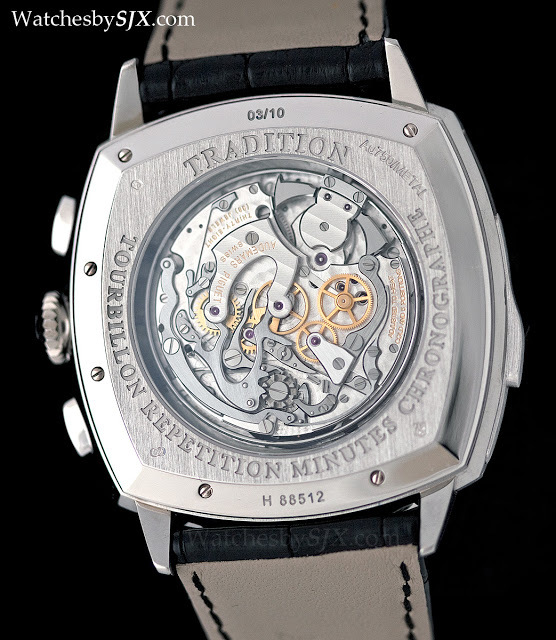 Likewise from the back, the cal. 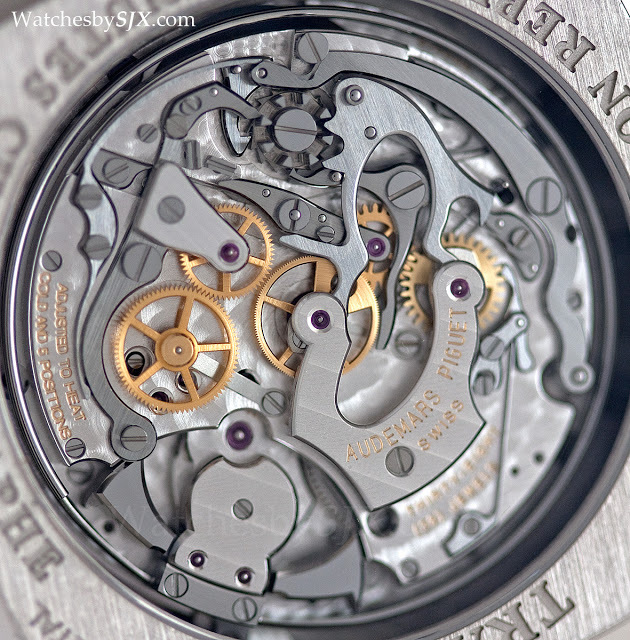 2874 movement is distinctly from APRP. 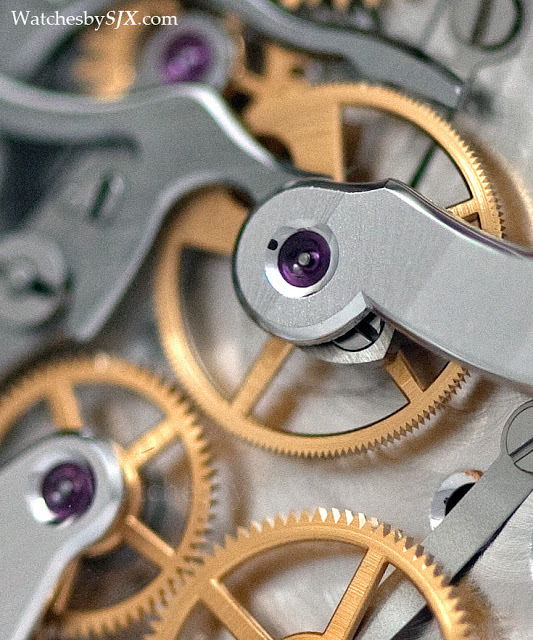 It has the blend of old style movement design, plus modern elements that APR&P often uses (for an even more avant-garde movement take a look at the Royal Oak Concept Watch 1). 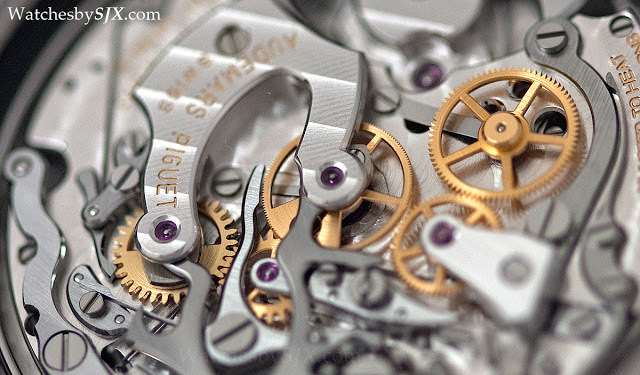 Take for instance the chronograph bridge layout which is quite traditional, coupled with the wide levers of the chronograph that are modern (like what has been done in the Lange 1815 Rattrapante Perpetual Calendar). 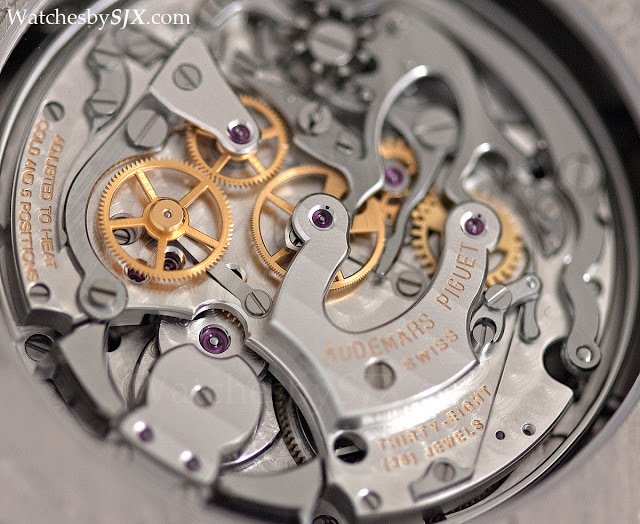 The finishing, which is superb, is recognisable as well. 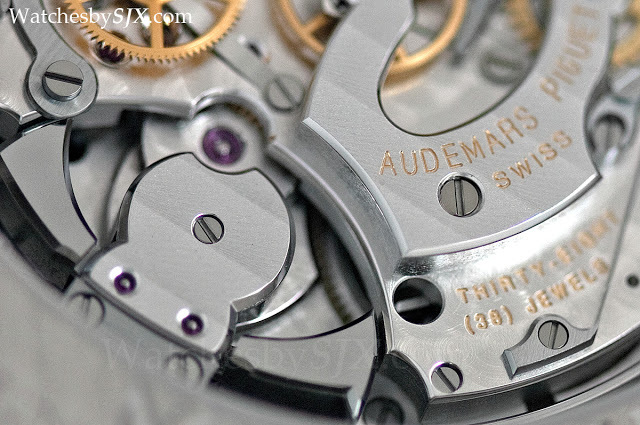 The anglage, or bevelling, of the parts is first done by machine, achieving a wide and flat bevel, before being polished by hand to a mirror finish. 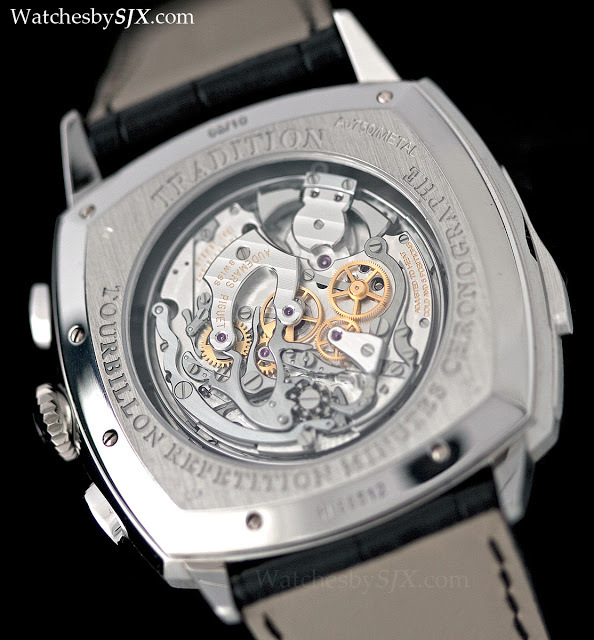 This too is characteristic of APRP movements. 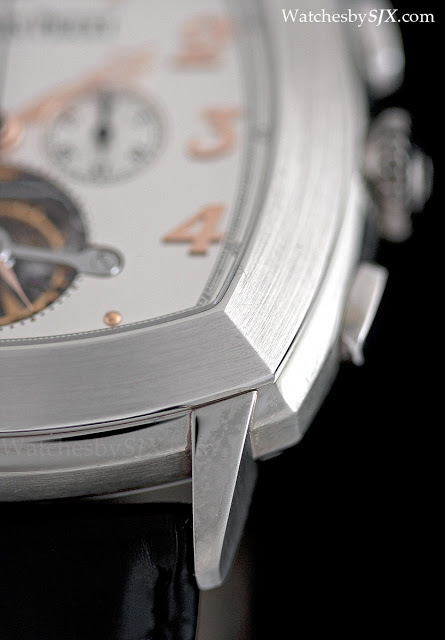 Interestingly in lower end AP watches, the anglage is similarly applied, except there is no hand-finishing subsequently.